The Americas have a rich tradition of tattooing. Continue reading here to find out more about the history of tattoos in America. Thinking about getting a tattoo? Do it! You’ll be joining the many that have come to understand the rich art that is tattooing. Though, tattooing wasn’t always viewed that way. Before you go jumping the gun, let’s take a look at the history of tattoos in America. You’ll be surprised to find how this art form has developed, and may even find inspiration for your next piece! Though socialites like McAllister may have looked upon tattoos with disgust, there were many who valued tattoos for what they represented. Those in the military, especially, shared the understanding that tattoos were symbols of courage and patriotism. Records of these 19th century-style tattoos were found in naval logs, letters, and diaries written by seaman. The designs of these traditional American tattoos developed from the artists who traded and improved upon each other’s styles. The tattoos evolved a series of stories and symbols that united soldiers and sailors across the World Wars. The most well-known tattoo artist of the time was Martin Hildebrandt. In 1870, Hildebrandt opened a studio on Oak Street in New York City, considered the first tattooing establishment in America. He worked there for over 20 years, where he would soon see a shift in the country’s perception of tattoos with the rise of the traveling circus. The traveling circus was the spectacle of the year for many small, rural towns across America. There, those who never left their homes and farms could experience such wonders and horrors that seemed out of this world. One of these sideshow attractions was that of the fully tattooed person. Frank and Emma DeBurdg were one of these exhibits. Along with the usual designs of patriotic insignias and religious symbols, the couple also displayed tattoos they shared to represent their relationship and bond. Frank had tattooed on him a beautiful script with the words “For Get Me Not” inscribed above a pretty portrait of his wife, Emma. She, in return, had their names beautifully adorned and displayed prominently for all to see. This display of affection for one another caught the attention of the public, appealing to their romantic senses. The DeBurdgs saw great success touring America and Europe, and with their exposure so did the art of tattooing gain appreciation with the public. Traditional tattooing was a bit cumbersome for the artist. Early tattoo artists used a needle attached to a wooden handle. They would dip this needle in ink and then manually stab the skin two to three times to imprint the ink onto a specific spot. The technique required great dexterity and mental fortitude. Samuel O’Reilly revolutionized the practice almost overnight. In addition to being a talented artist, O’Reilly was a skilled technician and mechanic. He theorized that if up and down motion of the needle could be automated, the artist could tattoo nearly as quickly as they could draw on paper. In 1891, O’Reilly released his invention and offered it to the public along with enriched colored inks, tattoo designs, and other tools. Tattooing in the United States was turned on its head overnight. O’Reilly was swarmed with orders for his invention as more and more artists entered the field of tattooing. Working class men in America commonly adorned tattoos primarily as symbols of masculinity and pride. Soldiers and sailors that served on foreign lands, however, brought home with them a different form of body ornamentation. While on their travels, these soldiers and sailors experienced the practices and customs of the indigenous cultures of Asia, Africa, and the South Pacific. Their individual uses of tattoos were a bit different from that of typical American art. This caused a revival of interest in tattoos in American societies across the country. That is to say, specifically, the rebel youth culture of the late twentieth century. The Beatniks of the 1950s and the Hippies of the ’60s gained a great appreciation for Asian tattooing practices. They admired the personal expression of spiritual and mysticism found in these cultures. Conversely, the youth of the Punk movement in the ’70s and ’80s used tattoos as symbols of rebellion. They found solace in tattoos as a representation for their feelings of imprisonment by society’s standards for class and decorum. While tattooing was once a taboo topic in America, now it’s a rising career field for many fledgling artists. More and more artists are being professionally trained in academies across the country. A study done in the late 1980s estimated that the number of trained artists per year has doubled in comparison to the number of artists that graduated in the ’70s. However, not as many galleries are being built to host the works of these young artists. But there are plenty of people looking for tattoos. As a result, these trained artists are bringing with them the plethora of skills and techniques they’ve learned from these art programs. They carry a sense of innovation and experimentation, already giving rise to new tattoo styles such as New Skool and Bio-Mechanical. 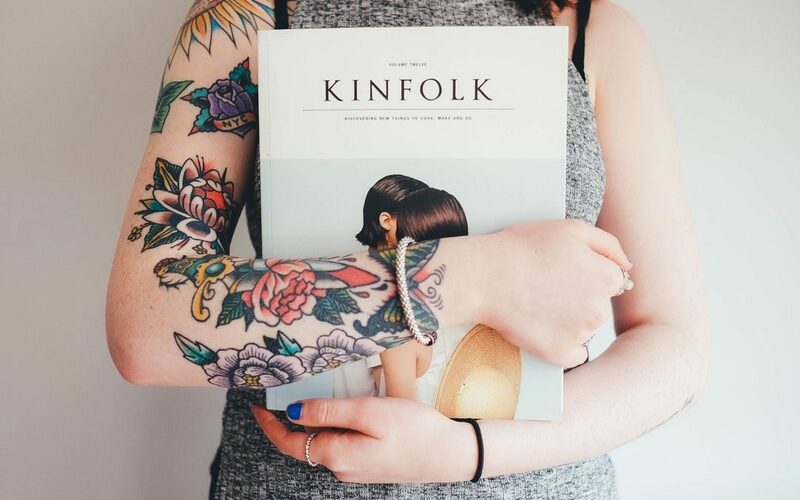 What was previously a disdained and marginalized artform, tattooing has been undergoing a process of cultural reform the past few decades. 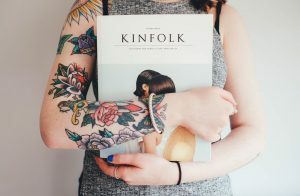 New meanings of tattoo are being developed by gallery exhibits and critics that reframe the practice for what it is: art. There you have it—the rich history of tattoos in America! If you’re in the area, give us a shout and we can give you an in-depth look at our history with tattooing. Our artists are always happy to give a consultation on any tattoo or design!